2015 St. Innocent, Pinot Noir, Temperance Hill Vineyard, Eola-Amity Hills AVA, Willamette Valley, Oregon. Mark Vlossak, one Oregon’s legendary Pinot masters, is still putting out outstanding wines, and his single vineyard bottling are some of the greatest values in North American Pinot Noir, especially his Freedom Hill and (this) Temperance Hill offerings. Vlossak’s 2015 Temperance Hill Vineyard is from mostly old vine plots, with the East Block coming from vines planted back in 1984, while the Pumphouse Block is from 1995, with the young R parcel is the only outliner being from a planting in 2004, all which are set on weathered basalt soils, only about 1o miles northwest of Salem on a hilltop that is much cooler than most of the surrounding sites in this area. This dark hued, garnet/ruby 2015 Temperance Hill from St. Innocent, which was 100% de-stemmed, was fermented in a combination of stainless and French oak fermentors with native yeast without SO2 and then raised in about 20% new French oak for 16 months, bottled unfined and all by gravity feed with no pumping, all to make a seriously pure and vivid example of Pinot Noir. Mission accomplished, as this is wonderfully fleshy and layer, with ripe fruit density, but sublimely fresh and vibrant with tons of energy showing a deep sense of place, allowing a heady perfume, spice and acidity to come through behind the core mix of black and red fruits. The palate seduces with dark roses, black cherry, plum and vine picked wild berries along with hints of Asian spices, dusty stones, light mineral tones, cedar and briar notes. 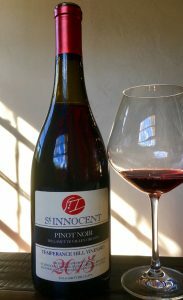 This Pinot is still youthful, as with most St. Innocent, it’s solid, it will gain with time in bottle, and it should age for another decade without much change, meaning no fall off, at all, so if you open this exceptional wine soon, decanting will allow a fuller opening, and be sure to plan an evening around it with a meal. Cuisine brings out so much more intensity, intrigue and elegance in this vintage and focuses the beautiful details and structure, this is fantastic stuff that gains with every minute of air and every bite of food allowing the tannins to melt into silk, while still holding it’s nerve. Drink this beautifully made Pinot Noir over the next 5 to 10 years, it is going to be rewarding over the long haul, even though it is close to sublime even now.